The American Pika lives in isolated rocky areas at up to 3,000 metres in elevation and is well-adapted to cold alpine climates. Biologists fear that these hearty creatures may not survive global warming; unlike many wildlife species that are shifting their ranges north or to higher altitudes in response to changing climate, pikas have nowhere else to go. The American Pika is a small member of the taxonomic order Lagomorpha, which includes rabbits and hares. It is well-adapted to cold alpine climates. Its very dense fur obscures its tail, which is actually the longest of all lagomorph tails. The American Pika lives in isolated rocky areas called talus formations, at up to 3,000 metres in elevation. Pikas feed on grasses and herbs and exhibit a behaviour called haying – during the summer they store fodder in crevices, which serve as a food store during winter when fresh forage is unavailable. American Pikas live in colonies and communicate via scent-marking and endearing vocalisations which make them sound like squeaky toys. Climate change is threatening the future of this species as it is physiologically intolerant of high temperatures and because its habitat is becoming increasingly unsuitable. Unlike many wildlife species that are shifting their ranges north or to higher altitudes in response to changing climate, Pikas have nowhere else to go. 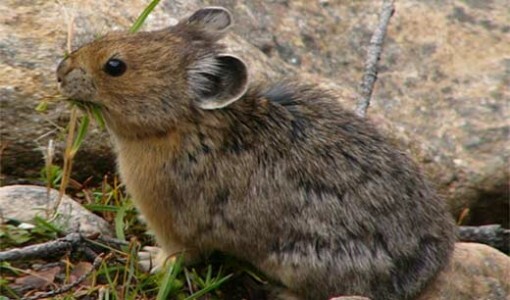 In some locations, entire Pika populations have already disappeared.